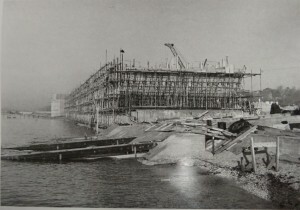 Late in September 1943 the War Office placed a demand with the Ministry of Supply covering the construction of a breakwater approximately six miles in length and made up of 147 separate monoliths or caissons. The caissons were divided into six groups. 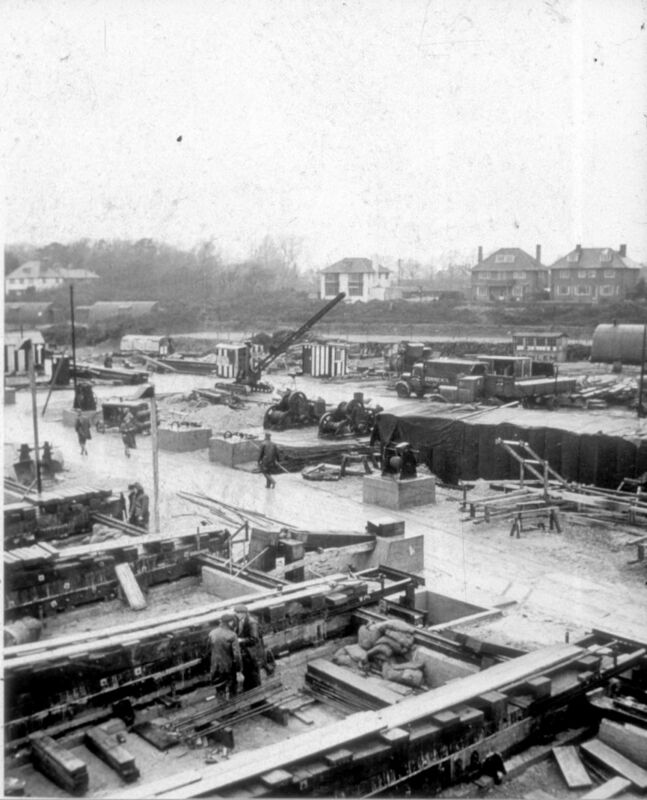 Stokes Bay was chosen as one of two sites for beach launched B2 Caissons where fourteen B2 units were constructed. Another site was at Lepe where six units were constructed. Four more were built at Langstone Harbour slipway, making a total of 24 B2 units (only 23 of which were completed). The B2 caissons formed part of the Mulberry Harbour for the British landing at Arromanches, Normandy. These units were partially submerged units that were towed out to the D-Day beach by tugs and sunk to form breakwaters for the floating roadways and pierheads. They were sunk where high tide would be about 10 feet below the top so they would always afford a barrier to waves entering the harbour. 147 Phoenixes of six different types in total were ordered. The largest of the Phoenixes, the A1 type, had a displacement of 6,044 tons, was 60ft high, 204ft in length and 56ft 3ins in breadth, formed of concrete. The B2 units were 203ft 6ins long, 44ft wide and 35ft high, divided into 22 compartments in two rows of eleven separated by dividing concrete walls 10ft thick at intervals of 16ft. The B2 type did not have anti-aircraft guns like other types and had sections at either end roofed over with concrete slabs. Both ends were formed into a swim end to facilitate towing. In each of the 22 compartments valves were fixed and the controls were carried by special couplings and shafts which were extended to a gangway which ran inside the caisson for the full length. The valves were for the purpose of flooding the floating casisson when placing the breakwater in its final position. At Stokes Bay two contractors worked on the construction of the Phoenixes, eight by Holloway Bros (London) Ltd on the east site and six by W.C. French on the west site (overseen by McAlpine), each unit requiring 100 men to construct, a combined workforce of 1,400 men supplied by the Ministry of Labour and all accommodated locally, working 12 hour shifts for 2s/1d hourly pay. Constructed continued day and night, seven days at week. The fourteen Phoenixes were all constructed at the same time on the shore at Stokes Bay, parallel with the sea one behind the other on keel block walls on a raised platform 2metres above the ground to allow them to be moved. The caissons were partially constructed to the 20ft level on the beach, launched sideways into the sea and then moored to composite piers, which were also constructed on site at Stokes Bay. Once moored the caissons were completed to their full 35ft height. They were then towed to one of two intermediate storage sites off Selsey and Dungeness, sunk to prevent them being seen from above and left to await the D-Day operation in June 1944. 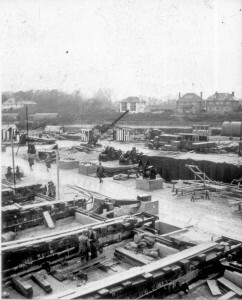 At Stokes Bay the two construction sites ‘Phoenix 1’ and ‘Phoenix 2’ were east and west of the present Stokes Bay Sailing Club building, between D Day embarkation hards G2, G3 and G4. 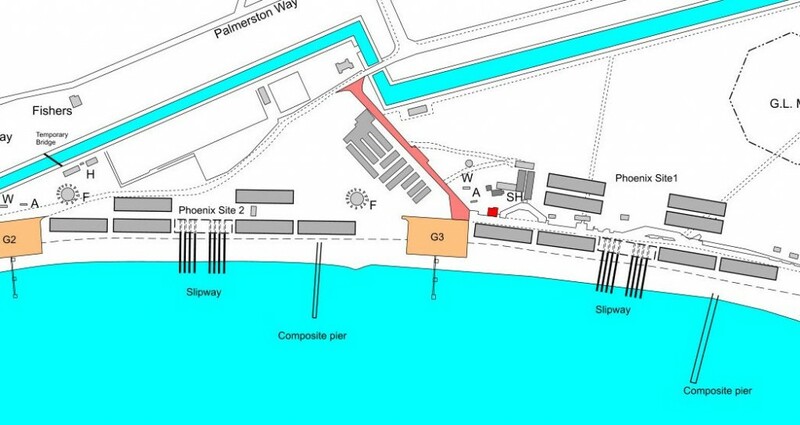 Centre of each section were the launchways. The sequence of launching the Caissons required a complicated system of winches. A complicated system of winches was required to manoeuvre each caisson in sequence to the launchway. An aerial view taken in 1944 shows six units on the western site, south of the modern children’s play area, one on the launch slipway, four more on shore waiting to be launched and one floating. At the eastern site east of the modern sailing club compound, the units were constructed in two rows, parallel to the sea. One caisson caused a disaster when being launched ‘got out of control and collapsed the launchway’. 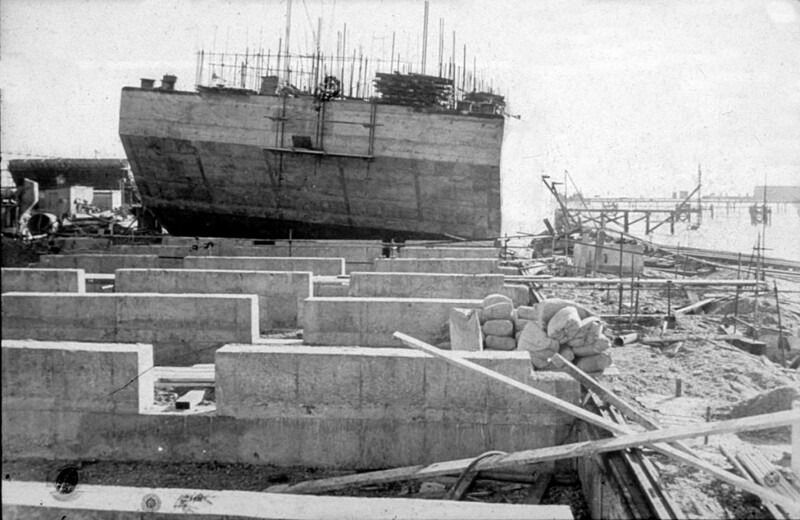 Three men died and fifteen men were trapped beneath it putting back construction by one month whilst the caisson blocking the launchway was removed. 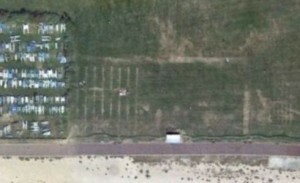 In dry Summer months signs of the concrete foundations on which the ball carriages ran can be seen as lines in the grass to the east of the Stokes Bay Sailing Club compound. The Gosport Society D-Day Memorial marks the spot. 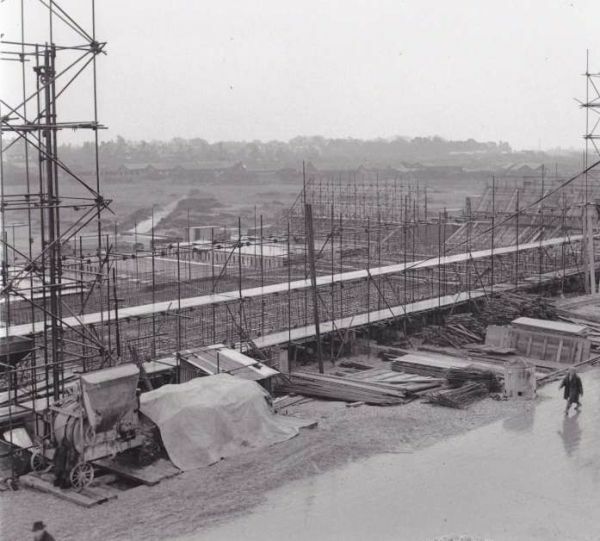 For more details of the D-Day construction sites at Stokes Bay.